With full updated ergonomic shaping and design details, the GP Pro R2 has taken an evolutionary step with an anatomically engineered design for performance, protection and comfort. Tested on MotoGP and WSBK circuits around the world, the GP Pro R2 features Alpinestars exclusive Dynamic Friction Shield (DFS) protectors feature advanced airflow ventilation and aramidic reinforcement, this glove is primed for superior track day performance. Full grain, multi-panel leather construction with a kangaroo leather and synthetic suede palm reinforcements for comfort, flexibility and feel. Alpinestars exclusive Dynamic Friction Shield (DFS) protectors feature advanced airflow ventilation and a dual density polymer construction for superior performance against repeat impacts as well as abrasion resistance. Advanced polymer compound palm and finger sliders for impact and abrasion resistance. Internal aramidic fiber hand and thumb reinforcement, plus an aramidic fiber layer around little finger gives excellent abrasion resistance. 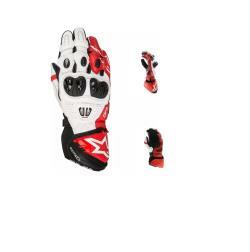 Alpinestars patented third and fourth finger-bridge prevents leather from twisting on fingers, and helps prevent seam failure and finger separation. A race-proven, anatomically contoured polymer wrist cuff wraps around wrist to protect wrist bone from impact. Closure incorporates Velcro wrist adjustable strap for secure, personalized fit. Dual cuff closure on wrist for a secure fit and precision adjustment. Anatomically engineered design for enhanced comfort, feel and control. Leather reinforcements on the palm and outer hand landing zones provide maximum abrasion resistance in key impact zones Additional comfort and fit performance provided by 3D foam padding on the top of the hand. 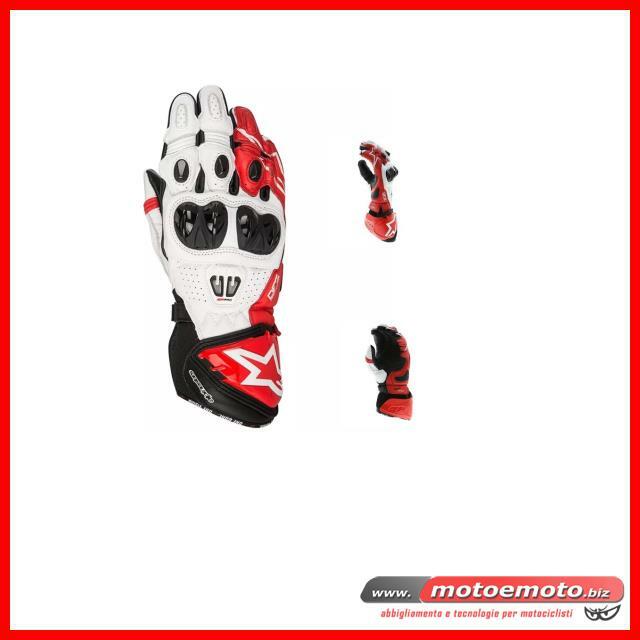 Alpinestars developed ergonomic stretch insert between thumb and palm offers flexibility to vastly improve hand movement. Leather accordion finger inserts with additional twin thumb stretch panels for increased maneuverability and comfort. Reinforced external finger and palm seams for close fit and superior feel. Localized perforations on palm and backhand, plus ventilated finger fourchettes help regulate internal temperature. Touchscreen compatible index fingertip allows the use of smartphone and GPS systems Printed logos for weight-saving and material integrity. The GP Pro R2 Glove is CE certified to Level 2.